Today Mrs. Conklin and her son, Wilburn Conklin, III visited the Crockett County Museum. They are the wife and son of Wilburn Conklin, II who was involved in the rescue of several Ozona men and women during the flood of 1954 via a motor boat borrowed from a visitor who just happened to be in town that night. These famous visitors along with Scott Hickman were in Ozona today to receive a plaque and recognition from the Commissioner’s Court for their heroic actions during the flood. 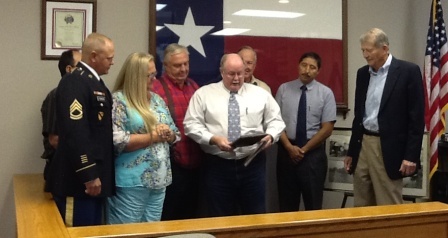 The picture is in the courtroom as the Commissioner’s were awarding the plaque’s. 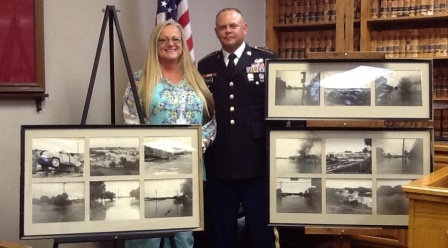 Also, the Conklin’s posed with the photo’s of the flood which are on display at the museum.